Kokila(Nayanthara) hails from a poor family and needs money to cure her ailing mother. In search of some substantial help, she meets a drug dealer and comes to know that this business can yield her decent money in quick time. After a few twists and turns, Kokila gets involved in a drug cartel’s internal war and also gets her entire family at risk. What are the hurdles she has to overcome in order to save her family? Will she be successful in this process? The answers to these questions form the core plot of the film. 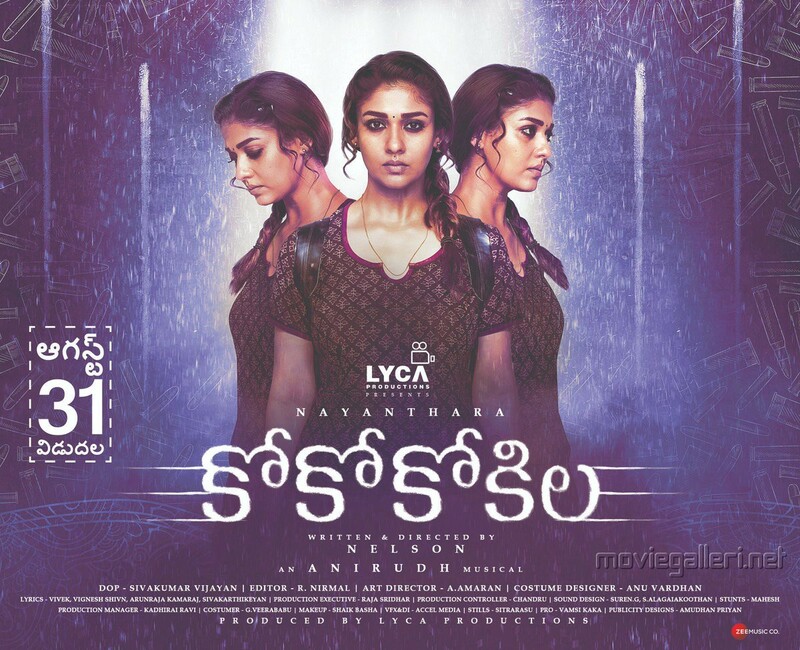 Coco Kokila (2018) Kokila(Nayanthara) hails from a poor family and needs money to cure her ailing mother. In search of some substantial help, she meets a drug dealer and comes to know that this business can yield her decent money in quick time. After a few twists and turns, Kokila gets involved in a drug cartel’s internal war and also gets her entire family at risk. What are the hurdles she has to overcome in order to save her family? Will she be successful in this process? The answers to these questions form the core plot of the film..
kokila movie is a nice family emotional and thirller movie ,nayanathara as kokila lives with her family her family was very poor and how hard to live in that way,in that her mother suffered with lung cancer ,how she rescued her mother is the movie in this time he decided and joined in drugs gang and changing drugs ,and she got troubles with police and some other persons ,so how kokila escaped and her family also is the movie ,comedy track in between movie is so joyfull and enjoyed till climax. KOKILA ,is a different story .its a huge mafia and emotional drama ,nayanathara as done her best in it again in this kokila chracter ,her family is poor and her mother was having cancer and want 15lakhs for operation ,so she decided for smugling cockin to others from one group .so here she get some problems from police and others her family also in danger .so how she managed and rescue her family .go and watch on big screen . nayanathara as KOKIKA ,recent movies of her and it was different story ,in this story he acted like a super star with that performance ,kokila was poor family and one fine day her mother was effected with lung cancer ,and she want to survive her mother ,and he decided to do some illegal things lke cocine smuglling ,she got problems and how she escaped from it is the movie .so go and watch on big screen . COCO KOKILA ,nayanthara as kokila ,he was a poor family oding some where jobs ,but there no good one he have in this sudden way her mother was effected with lung cancer and she wanted huge money for operation ,so she was so sad for that crying for her mother .one day she get some accidental issue one criminal aresseted by her and that gang warns her ,and she was go to that gang and join in that gang changing cockin to others ,in this time she and her family get involved and troubles very badly ,what are the troubles and how they escaped from all these is the movie. lady super star ,nayanathara is back with action and family thriller movie ,movie s a a gilr was doing some bad things to rescue for her mother hospital treatement ,in this character nayanathara was good in it , whole movie is so entertained and comedy track in serouis situtation aslo ,laughs every one .over all movie is good . On The Whole, CoCo Kokila Is An Unconventional Dark Comedy That Has A Serious Plot. Good Performances From..